“I’m not bivariate, but I am curious.” That quip has been stuck in my mind ever since I overheard it at the 2013 NACIS conference in Greenville, SC. Not only was it perfectly timed after a talk about bivariate mapping, but it rang with a great deal of truth: a lot of folks aren’t creating bivariate maps, but they want to try. While it was just a joke and the person who made it can easily create bivariate maps, most people find them too difficult or mysterious. That’s a real shame because bivariate choropleth maps are incredibly useful and very easy to make. So let’s go ahead and make one! In some very real ways, polar sea ice is the backbone of our planet’s climate. When more ice is present, its bright surface tends to reflect sunlight, cooling things down. When there is less white, snow-covered ice, the ocean’s surface becomes a bit darker. A darker ocean surface absorbs more sunlight, causing it to warm. The relationships between climate and ice are much more complicated than that, as the thickness of the ice also influences a variety of subsurface feedback loops that have long-term effects. Shaded relief maps are among my favorite of all map types. Not only do they form the foundation for many other maps and derivative layers, they present a fascinating challenge: depicting an abstraction of terrain in a natural way while balancing accuracy with aesthetics. This push and pull between modeling a natural phenomenon (the illumination of Earth and the shadows cast by the sun) with artistic purposes has captivated cartographers for centuries. It’s no surprise that as technology advanced, so too did the modeling of the sun’s rays. With this in mind, I wondered how techniques in 3D ray tracing carry over to shaded relief mapping. Open Source Copyright Infringement: Are DMCA Takedowns on GitHub Increasing? While browsing /r/linux I saw this post: Rate of DMCA takedown demands is increasing on GitHub. That sounds pretty scary, for a couple of reasons. On one hand, it could mean that companies are really dropping the hammer and coming after folks more often and potentially in error. On the other, it could mean the open source community is becoming more lax or lazy, using others’ code without respecting licenses or copyright. But could there be a third alternative? Is the rate of DMCA takedowns really increasing in a meaningful way? Fortunately GitHub is open about the DMCA notices they receive. Since January 27, 2011 GitHub has posted each request received and each counter-notice issued. All 317 of them. For most of us, insect stings are a thing to avoid. That’s not the case for entomologist Justin O. Schmidt. That’s because Dr. Schmidt has dedicated his life to studying venomous hymenopterans, the order of insects made up of ants, bees, and wasps. Through his research, he has been stung countless times. As a result, he developed the Schmidt Sting Pain Index. I stumbled upon Schmidt’s work after seeing this video of warrior wasps. One of the noteworthy characteristics of warrior wasps is that when threatened, they rhythmically flap their wings against their bodies in perfect synchrony, producing a sound not unlike marching soldiers. The other characteristic these wasps are known for is a sting that hurts! Note: In September 2017 this site was rebuilt with Hugo. The text below no longer describes my own site, but I would still use Middleman (or any other static generator) over WordPress. Recently I’ve spent a few evenings removing WordPress and rebuilding this site on top of Middleman. The new site is still a work in progress and I have more features to add, but all of the previous content has been brought over. It should be safe to launch this. So why did I do it? Over the past two years I’ve become increasingly frustrated with WordPress. Despite serving compressed pages, caching data, and reducing unnecessary scripts, page load times seemed to increase with each new version. Some of my more popular pages were averaging 5 seconds to load. That’s ridiculous. Even when WordPress itself performed well, it required additional plugins just to have reasonable features (e.g., caching, contact forms, spam protection, SEO optimization, etc.). Each of these requires constant updates, and one can never be sure if updating one plugin is going to break other plugins, or worse, the entire site. Compatibility reports from other users are helpful, but are often incomplete. Logging in just to write a simple post became a chore: update this, double check that, fix this other thing that the previous update broke, and so on. Long story short, it got old. Yesterday was Memorial Day. Like many other Americans, my family and I spent this day of national remembrance at a local park. We made the short trip to historic Boalsburg. Those in the know will recognize that Memorial Day in Boalsburg, PA is no ordinary affair. It is a massive celebration. This was especially true this year, which marks the 150th Memorial Day celebrated in Boalsburg. Thousands of people from all over gathered to honor our veterans who gave the ultimate sacrifice. What started as a time to decorate graves with flowers has now grown into a large festival, with celebratory events found at every corner of the township. It was also a learning opportunity. Almost everyone knows about Pennsylvania’s vital role in the Civil War and the importance of Memorial Day in the region. As a Michigan native, what I didn’t know was that Boalsburg itself was the very birthplace of Memorial Day. For the last several weeks, I’ve been creating a visualization of past and predicted conflicts in Afghanistan. The data, which come from a statistical model developed by Jay Yonamine with help from John Beieler, show us what might happen based on a long history of what has happened. The database behind this model is known as GDELT, or the Global Database of Events, Language, and Tone. GDELT has received a lot of attention lately and I’ve participated in two hackathons that have emerged around it. After Wired showed interest in publishing this story along with the visualization, I was thrilled. Every now and then a dataset comes along that just has to be mapped. This is one of those times. Bigfoot. Sasquatch. Skookum. Yahoo. Whatever you call it, the towering man-like ape is a folklore staple. From stories of Yeti in the Himalayas to Wildmen in the Pacific Northwest, people have been talking about and trying to find the creature for ages. Occasionally, some form of evidence – like Patterson’s famous 1967 film – emerges and either feeds our fascination or gets dismissed as a hoax. In either case, it’s easy to see why believers search for proof and skeptics remain doubtful. 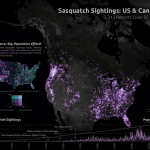 Through archival work and reports submitted directly to their website, the Bigfoot Field Researchers Organization has amassed a database of thousands of sasquatch sightings. Each report is geocoded and timestamped. Occasionally, even photos and videos of the alleged evidence are included. I’m not quite sure how I stumbled across this, but I’m glad I did. Traffic maps are among the most widely used maps available today. Whether they are accessed through a web browser, an app on your smartphone, or an in-vehicle navigation system, many popular maps include a traffic layer – and for good reason. The proliferation of live traffic information is extremely beneficial. With real-time congestion data we can avoid delays, plan better routes, and get to the places we need to be when we need to be there. 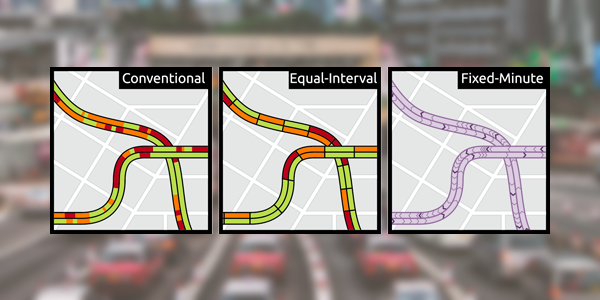 Traffic maps simplify this process and clarify the costs and benefits associated with various routes.